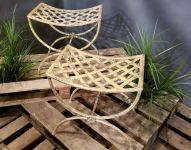 Pair of French Garden Stools; Pair of early 20th century French metal garden stools with cross hatched seats and X-form bases embellished with flower shaped rosettes. 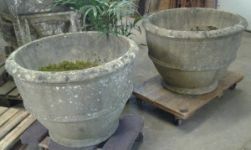 Large Pair of French Faux Bois Planters; We could not resist this stunning pair of mid-20th century oval faux bois planters of a very generous size with a deep planting area. Naturalistically decorated with raised feet forming integral branc.. 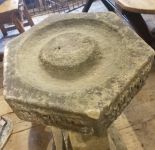 Tall English Carved Stone Birdbath; A fine English hand carved stone bird bath found in the rural “West Country”. The hexagonal top features raised carving on all sides which continues through the stepped base. 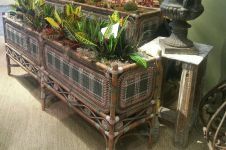 This is one of th..
French Faux Bois Garden Seat; Rustic French faux bois bench found in the south of France. All of the components of this wonderful garden seat are sculpted to resemble natural tree branched or sawn wood. Circa: 1950 ..
Exceptionally Large Faux Bois Bird Cage; This is probably the largest and certainly most over the top faux bois bird cage we have ever come across! 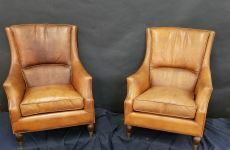 Highly decorative, in three sections, complete with integral perch as well as an unusual m..
French Leather Chairs; These very chic French chairs covered entirely in their original leather have now aged to a wonderful dark honey hue. Beautifully detailed with nail head trim and and turned wood front legs that termi..
English Reconstituted Stone Buddah; Nicely detailed English cast stone statue of Buddha which has acquired a very pleasing weathered surface from its many years of residing in a Norfolk garden. 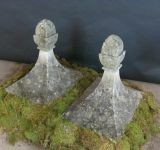 French Carved Stone Finials; A simple but elegant pair of early 20th century French carved limestone gate pier finials with stylized pine cone tops and gracefully sweeping bases. 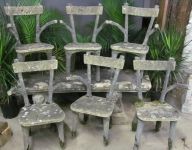 Set of Six French Faux Bois Chairs; A matched set of six faux bois arm chairs is extremely hard to find, and we were very excited to come across this set in the south of France. The surface is lightly covered in lichen and moss but not .. 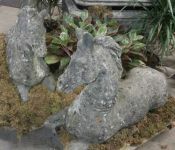 Pair of English Reconstituted Stone Horses; Pair of nicely weathered mid-20th century English reconstituted stone reclining horses. English. 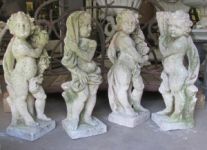 These fellows would be the perfect enhancement for any garden or flanking a doorway or entrance. Cond..
French Terracotta Cat Figure; French turn of the century figure of a watchful cat. 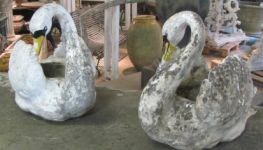 Possibly originally used as decorative element on a roof. 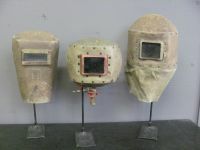 Condition: minor losS to tip on one ear, weathered surface consistent with age and outd.. 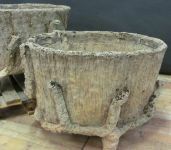 Pair of Large French Wicker Planters; Simply the best pair of French wicker planters we have ever owned! From a café in the 7th arrondissement in Paris this pair still retain their original zinc interior liners, with bail handles, and w..
Italian Limestone Four Seasons; A very nicely detailed set of early 20th century four seasons hand carved in Italian Limestone, each figure with its seasonal attribute: Winter wrapped in a cloak; Spring with flowers; Summer with wh..
19th Century Carved Marble Anchor; Originally starting out as part of a larger public works display in the Liverpool docks area, in later years this intricately detailed and now well weathered piece (all hand carved from a single bloc..
French Reclaimed Stone Table; Simple and elegant French reclaimed stone table in a great size with a lovely surface. This table has large balustrade base supporting the thick round top with canted edge. 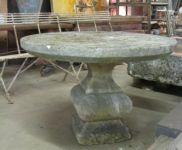 French Stone Fountain; French reclaimed antique stone wall fountain with pedestal form back . The re-cut rectangular basin has a solid bottom (no need for a liner) and the small side pocket will hold and disguise a pump..